A "cool" new attraction will be coming to Disney's (DIS) Epcot in Florida, but it may prove to be as initially controversial as it will ultimately be popular. The Maelstrom boat ride in the Norway pavilion will close early next month and be replaced by an attraction themed to Disney's popular animated film "Frozen" come early 2016. The Internet was buzzing among Disneyphiles when the news broke late last week. Purists complained that another iconic attraction was going away, fearing that Epcot's World Showcase will now be overrun with young fans dressed up as Anna, Elsa and other characters from the movie. Others are looking forward to the move. With "Frozen" ringing up nearly $1.3 billion in ticket sales during its theatrical run since premiering last November to become Disney's highest-grossing animated feature of all time, it's easy to see why there's no shortage of excitement. However, it's safe to say that Norway isn't very happy, and not just because there will be one fewer reason for Epcot guests to venture into the tourism-boosting pavilion through the next year and change of construction. The days were numbered for Maelstrom, a short boat ride that explores Norway with nods to Vikings, trolls and offshore oil drilling. It may have been one of only two actual rides in the World Showcase half of Epcot, which features several country pavilions -- and the only one that ever commands much of a queue -- but it was also longing for an update. A news report out of Norway in July discussed the country's reluctance to funding the pavilion, rightfully predicting that Maelstrom could close as soon as October to make way for the "Frozen"-themed ride. Norway was reportedly resisting Disney's request to pay roughly $9 million to update the pavilion. However, a more controversial nugget beyond the international tussle taking place behind the scenes to preserve the integrity of the pavilion is that "Frozen" doesn't take place in Norway. Animators may have headed out to Norway to capture the Scandinavian surroundings and way of life, but Disney's story takes place in the fictional town of Arendelle. Some will argue that replacing a ride filled with spell-casting trolls and an enchanted tree won't suffer from going down the rabbit hole of make-believe, but at least the trolls are part of Norwegian folklore. "Frozen" is Disney's handiwork, based loosely on Danish author Hans Christian Andersen's "The Snow Queen." Can this really remain a Norwegian pavilion when its biggest draw will be a place that likely doesn't belong in Epcot's World Showcase or Epcot at all? Epcot attracted 11.2 million guests last year, according to Themed Entertainment Association, making it Florida's second most popular theme park after the original Magic Kingdom. Can Disney afford to lose the park base that values authenticity in the pursuit of fans of "Frozen" who may not be as excited about the property in two years? Disney has been relentless in milking "Frozen" since it smashed full-length-feature animation records 10 months ago. Some of the longest lines at the Walt Disney World resort haven't been for its classic thrill rides. 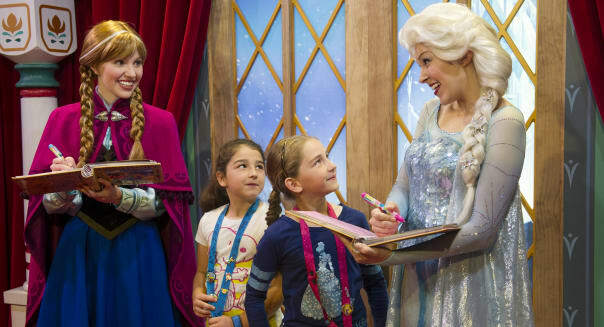 It's young costumed girls with their families waiting sometimes several hours to take a photo with the film's princess sisters, Anna and Elsa. The most extreme milking is taking place at Disney's Hollywood Studios in Florida, where a parade, skating rink, singalong show,and nighttime fireworks show have been added this summer and extended through the end of this month. Last week's announcement of Maelstrom's replacement also accompanied news that the singalong and snow-play areas would be extended and expanded beyond Sept. 28. Disney's also releasing a new animated short, "Frozen Fever," that will hit theaters next year, and it wouldn't be a surprise if this replaces the movie that guests can watch on the way out of the soon-to-be-former Maelstrom ride. Disney's making Norway and theme park purists angry, but there appears to be more money to be made by delighting fans of "Frozen" in their place. Motley Fool contributor Rick Munarriz owns shares of Walt Disney. The Motley Fool recommends and owns shares of Walt Disney. Try any Motley Fool newsletter service free for 30 days. Find new ways to earn high yields withour free reporton dividend stocks.